So sorry I haven't been around much! I either haven't been able to get around your blogs or I've been too frustrated trying! Anyhoo, enough moaning for one day! Lol! Today sees the start of a new week & the new challenge over at Eureka Stamps! I decided to let the elements speak for themselves. I coloured the image with ym promarkers then cut out with a spellbinders die. I added a bit of distress inks to the image & the sentiment. The paper was from Lidl, I love those papers. The button is from my stash & the hessian/burlap is from the £1 shop. I added a little raffia bow behind the button. The sentiment panels were popped up on a little foam tape. I added a little bit of decoration to the inside of the card too! & ghost from another paper. The Boo is cut from the paper too! Another quick look at my card from the side. 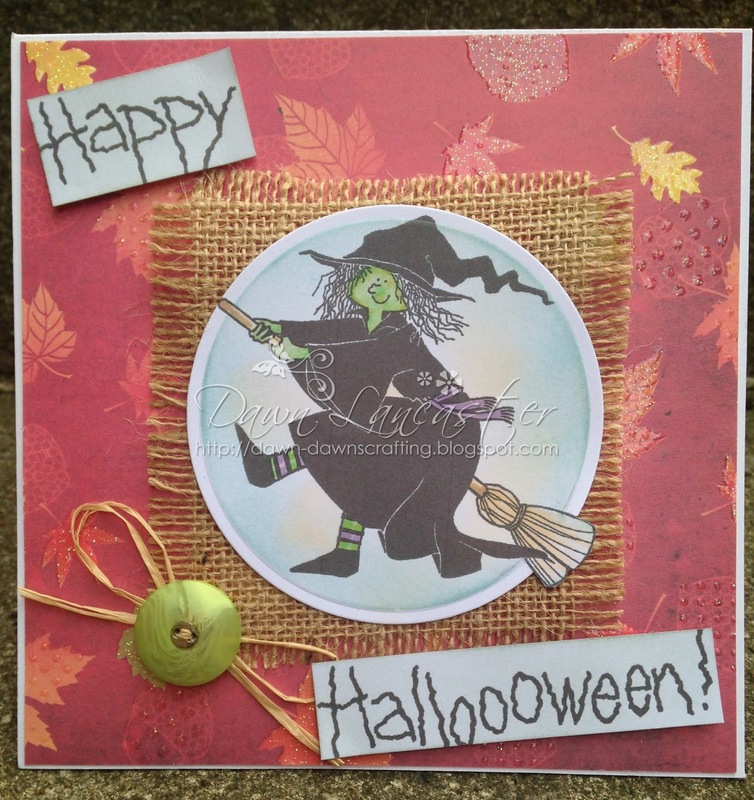 Halloween challenge over at Eureka Stamps this week! great card Dawn - really like the hessian layering - lovely, "extra" tactile touch! 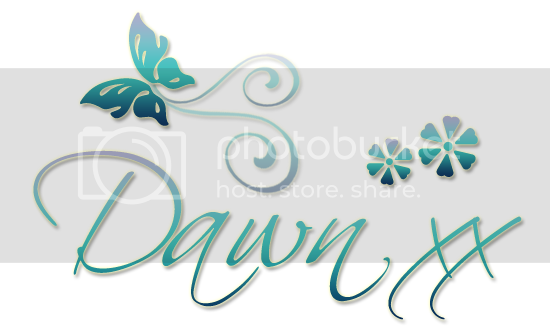 Hi Dawn, hope you are feeling better now. Fabulous card, I just love the autumn colours. Your colouring is beautiful and I still can't believe how great you Lidl papers are! Awesome card, feel better, the mesh behind your image looks really cool, great card. I hope you are on the mend now Dawn. 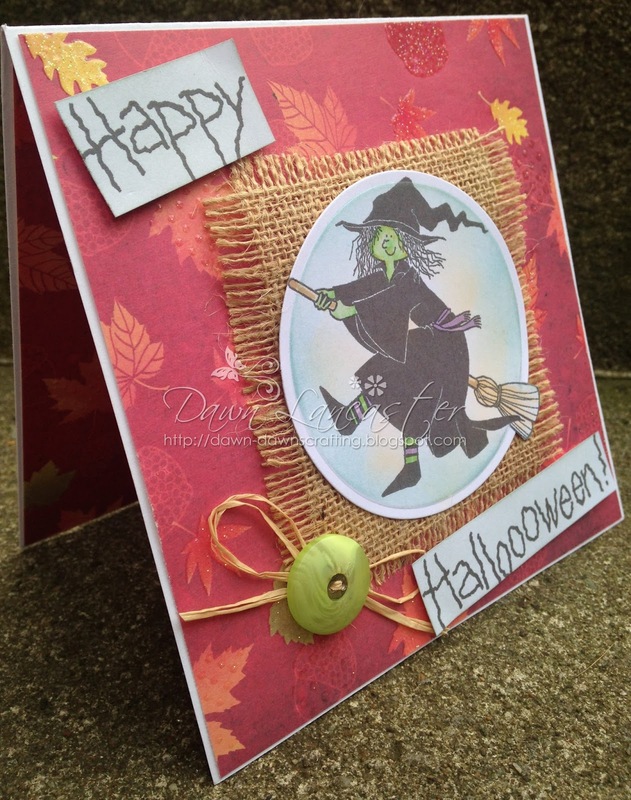 Loving the witch and papers a fabulous Halloween card. A super Halloween card Dawn. Love the image and design. 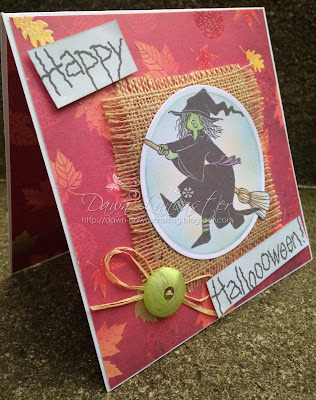 Fun design, love your green faced witch and the added texture, it's so sweet! A great Halloween card Dawn, such a fun image. 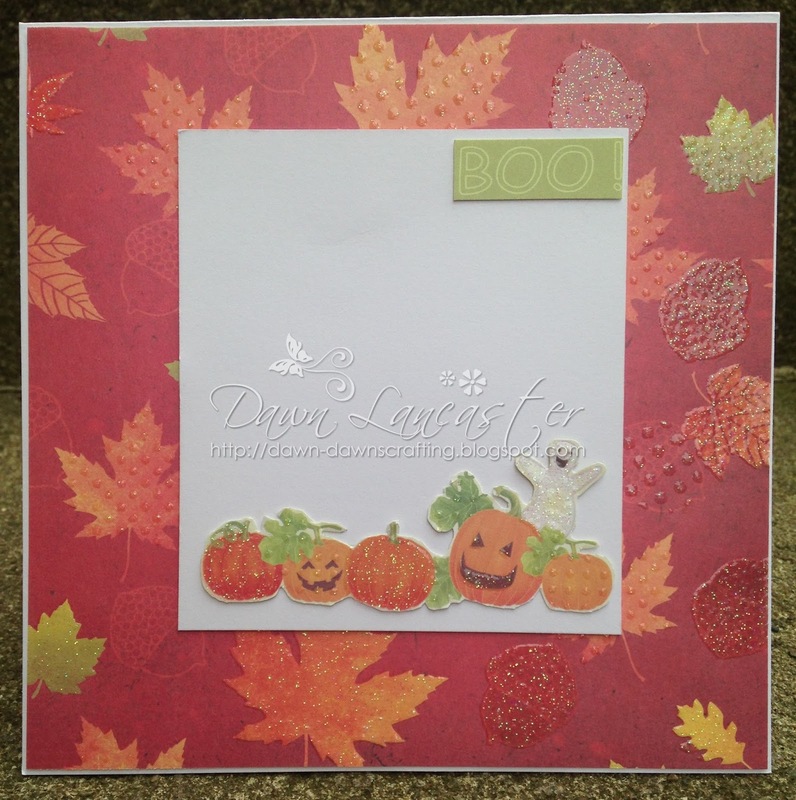 Love this fun Halloween card, great background paper. Must check out the pound shop for the Hessian. There is just nothing better than a smile from a happy witch! Love you fun card and also the way you finished the inside is perfect! WOW super fun card inside and out!!! October LINKY challenge. Have a blessed day, DIANA L.
Your card just doesn't seem scary at all. It is rather cute and the witch looks Happy to be on her broom. I like how you finished the inside as well. Feel better soon and congrats on your win. Don't forget to claim your prize. Such a fun Halloween card. Great job! Thanks for joining us at Creative Corner Challenges this week! Sweet card love the witch. Thanks for joining the DRS designs challenge. Simple fabuuulous. Thanks for joining in on the fun over at Aud Sentiment Challenge. We look forward to seeing you again. Fab card. love the image and the papers. Hessian square looks great behind the witch. Hugs Mrs A.
Fabulous card Dawn, inside and out!! 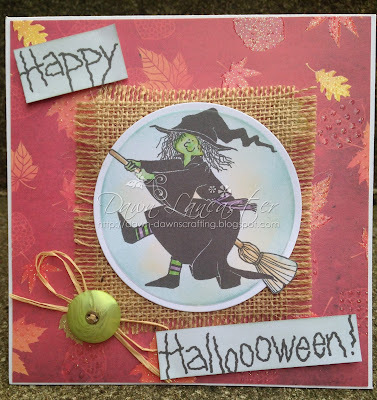 I am back again - I didn't realize you entered this in the DRS Designs Challenge so I am back to thank you for joining us and sharing your super fun Halloween card! Many hugz to you my friend! Love the witch, Dawn, love the sentiment, love, love, LOVE the burlap! Great Halloween card design. :-D Hope you're feeling better now. Thanks for playing in our "FALL OR HALLOWEEN IMAGE - YOUR CHOICE" Challenge #115!